Cholera kills 1,555 in Nigeria, says U.N.
Nigeria has suffered its worst cholera outbreak in recent years. Other African countries such as Sudan, pictured, also suffer. Lagos, Nigeria (CNN) -- A cholera outbreak in Nigeria has killed more than 1,500 people, the United Nations said Tuesday. 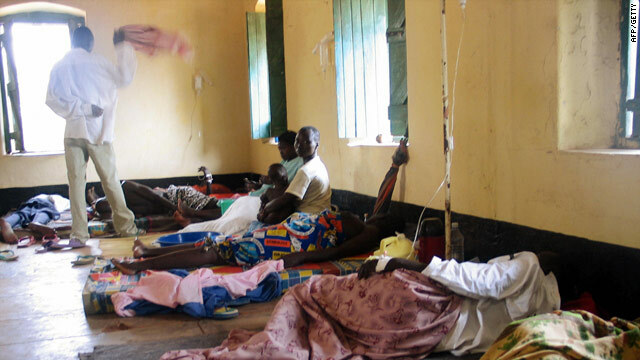 It is the worst cholera outbreak in Nigeria in recent years. The number of cases is three times higher than last year and seven times higher than in 2008, the United Nations Children's Fund said. The outbreak has led to 40,000 cases in Nigeria and resulted in 1,555 deaths, UNICEF said. Women and children account for four of every five cases, the agency said. The disease's spread seems to have been largely contained in Nigeria, where new cases are still being reported in parts of the country, particularly the northeast, the United Nations said. Cholera: What causes it and how it spreads? Several hundred deaths also have been reported in Cameroon, which borders Nigeria. "There's a lot of people crossing over the border all the time," Dr. Eric Mintz of the Centers for Disease Control and Prevention has said. "So it's not surprising that cholera is also crossing over the border." Mintz is leader of the global water sanitation and hygiene epidemiology team for the Atlanta-based CDC. Cholera is caused by a bacterial infection of the intestine and, in severe cases, is characterized by diarrhea, vomiting and leg cramps, according to the CDC. In such cases, rapid loss of body fluids can lead to dehydration and shock. "Without treatment, death can occur within hours," the agency has said. A person can get cholera by drinking water or eating food contaminated with the bacteria. During epidemics, the source of the contamination is often the feces of an infected person, and infections can spread rapidly in areas where there is poor sewage treatment and a lack of clean drinking water. The disease kills about 120,000 people a year, according to the World Health Organization. Two-thirds of rural Nigerians lack access to safe drinking water, and fewer than 40 percent of people in affected areas have access "to toilet facilities of any description," the Nigerian Health Ministry said in August.